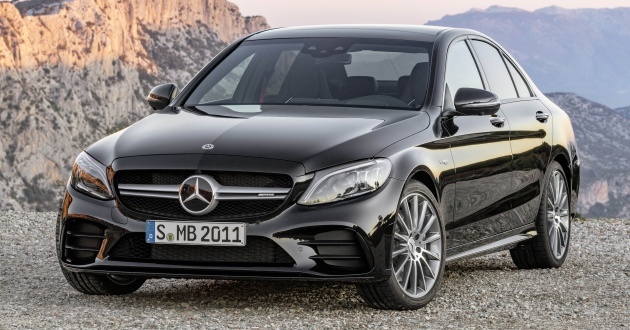 Shortly after the debut of the updated W205 Mercedes-Benz C-Class, it is now time for the Mercedes-AMG C 43 4Matic to get its facelift. The revisions involve both the vehicle’s aesthetics as well as available equipment and performance. We’ll start with the last item, where the 3.0 litre biturbo V6 has been tuned to produce 385 hp at 6,100 rpm, which is 23 hp more than before. Meanwhile, the peak torque of 520 Nm is now available from 2,500 to 5,000 rpm. A nine-speed AMG Speedshift TCT 9G automatic transmission is paired with the engine, along with an AMG Performance 4Matic all wheel drive system. Together, it takes the Sedan just 4.7 seconds to complete the 0-100 km/h sprint (4.8 seconds for the Estate). The top speed remains electronically limited at 250 km/h. Design-wise, the new car now comes with a twin-louvre AMG grille and additional flics on the front apron, following more recent AMG models like the CLS 53. Meanwhile, the rear features a more prominent diffuser and circular exhaust pipes. Add on the optional AMG styling package, and you’ll get a more expressive front splitter, spoiler lip, broader side skirt inserts and flics in the rear bumper that are finished in high-gloss black. Complementing the styling updates are a few wheel options ranging from the standard 18-inch five twin spokes in tremolite grey, to the optional 19-inch five twin spokes that are available in tantalite grey, high-gloss black or matte black with a high-sheen finish. Moving inside, Artico leather, Dinamica microfibre and aluminium continue to be featured heavily. Additional trim elements now include anthracite open-pore oak wood, open-pore walnut as well as longitudinal-grain aluminium for the doors and black open-pore ash wood for the centre console. If carbon-fibre is preferred, the AMG trim pairs the material with light longitudinal-grain aluminium and matte silver fibreglass. There’s also a range of upholstery options, including those from the designo range. On the tech side of things, the C 43 gets a 12.3-inch digital instrument cluster with three AMG-specific styles available – Classic, Sport and Supersport. The display can also be customised for specific functions like to see engine data, g-forces and even a race timer. Elsewhere, the infotainment system can now be paired with a 10.25-inch display (1920×720 pixels), which is an upgrade from the standard 7-inch (960×540 pixels) unit. The familiar COMAND rotary knob continues to be of service here, now backed by Touch Control buttons on the new Nappa leather-wrapped, flat-bottom steering wheel (also available with Dinamica microfibre trim). The AMG Track Pace feature is also present in cars that are equipped with the COMAND Online infotainment system, allowing owners to gather relevant track-driving data. 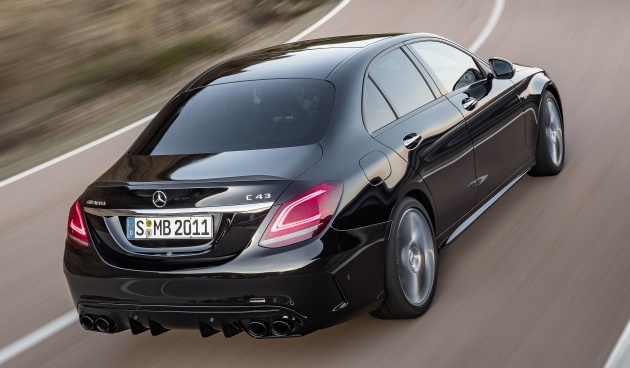 The Energizing comfort control system also makes its way into the C 43. Other changes include a fifth mode, ‘Slippery’, for the AMG Dynamic Select system, which joins the existing ‘Comfort,’ ‘Sport,’ ‘Sport+’ and ‘Individual’. These modes alter the characteristics of the powertrain as well as the AMG Ride Control suspension and speed-sensitive steering. Still lesser hp than my AMG A45. 3L V6 twin tebo on a AWD? A refined gentlemen R35 GTR. A man with Grey hair or ho hair will prefer the E250, save RM100k not to mention bigger boots & rooms to boot. Maybe this C43 will suit a younger lawyer after being accepted as a partner to a firm to celebrate his achievement !! Previous Post: SPIED: 2019 Honda Pilot facelift spotted – eight-seat SUV to get new Insight’s dual-motor hybrid system?